"This is a budget for the military industrial complex, for corporate CEOs, for Wall Street, and for the billionaire class." If a budget is a statement of values and priorities, President Donald Trump's proposal for fiscal year 2020 clearly displays his commitment to enriching the wealthy at the expense of ordinary Americans. "Make no mistake about it: Trump's budget is a massive transfer of wealth from working class families to the wealthiest people and most profitable corporations in America." That was how Sen. Bernie Sanders (I-Vt.) characterized Trump's $4.7 trillion budget request on Monday after the White House released details of the plan, which includes a massive increase in military spending and trillions of dollars in total cuts to Medicare, Medicaid, and Social Security. "The Trump budget is breathtaking in its degree of cruelty and filled with broken promises," Sanders, the ranking member of the Senate Budget Committee, said in a statement. "Donald Trump promised the American people that he would be a different type of Republican, that he would be a champion of the working American and that he would not cut Social Security, Medicare, and Medicaid. But his budget does the exact opposite of what he promised the American people." 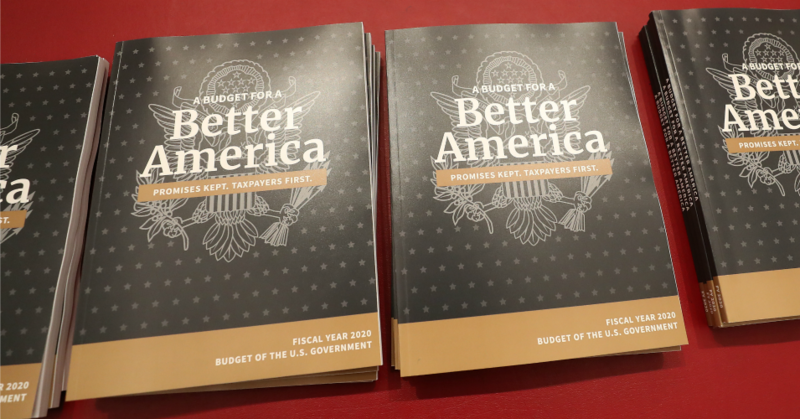 Over the next decade, Trump's budget—officially titled "A Budget for a Better America"—would slash Medicaid by $1.5 trillion, Medicare by $845 billion, and Social Security by $25 billion, according to Sanders' office. The president's blueprint also requests $8.6 billion in border wall funding. "This is a budget for the military industrial complex, for corporate CEOs, for Wall Street, and for the billionaire class," Sanders said. "It is dead on arrival." This is a budget for the military-industrial complex, for corporate CEOs, for Wall Street and for the billionaire class. Giving the Pentagon "even more than it hoped for," Trump's budget calls for an $861 billion increase in base military spending over the next ten years. That sum, Sanders said, "could make public colleges and universities tuition-free over the next decade." Warren Gunnels, Sanders' staff director, tweeted: "We don't need a magic wand or a genie to make public colleges free. We need to get our priorities right." As the Washington Post's Jeff Stein and Amy Goldstein reported, Trump's budget proposal calls for coverting Medicaid into a block-grant system and handing states the power to set coverage rules—a move that would endanger the healthcare of millions of low-income Americans. "Make no mistake about it: Trump's budget is a massive transfer of wealth from working class families to the wealthiest people and most profitable corporations in America," Sanders concluded.